Paul Ingraham • Jun 11, 2014 ARCHIVEDMicroblog posts are archived and rarely updated. In contrast, most long-form articles on PainScience.com are updated regularly over the years. 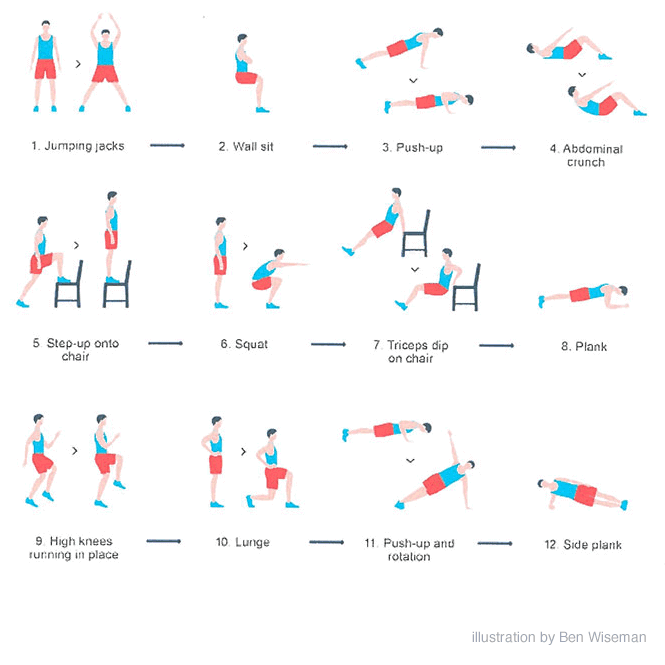 I’ve been doing this workout regularly for months now: the “Scientific 7-Minute Workout.” I think it’s a great idea, and I’m endorsing the heck out of it today. The more I study pain, and the longer I live with my own litany of musculoskeletal complaints, the more convinced I get that fitness is great medicine for most kinds of chronic pain. And yet, awkwardly, exercise is also a very bitter pill for the people who need it the most. Chronic pain and getting out of shape feed on each other, a downward spiral with a fierce grip. Reversing that vicious cycle is one the hardest things there is; the slightest advantage is precious. And the surprising efficiency of exercise is one of the only things working in our favour. The workout is based on the good-news principle that small, intense exercise doses are much more effective than most people realize — not just better than nothing, but greatly so. The workout is well-rounded and requires only a chair and a few minutes of oomph: a dozen simple exercises, each performed for 30 seconds, with a brief break between each of them. It was designed by exercise scientists Brett Klika and Chris Jordan, and published in ACSM's Health & Fitness Journal (see Klika et al), and nicely explained and summarized by Gretchen Reynolds for the New York Times, which became the 6th most popular article the Times published in 2013. People love the idea of exercising efficiently! It also adapts nicely to injury rehab. For instance, if you are recovering from a stubborn knee problem like patellofemoral syndrome, you can skip the exercises that stress the knee — exercising everything else as efficiently as possible. The order of the exercises matters, and so does the oomph (it’s brief and simple, not easy). Read more about it and then try it: there are also dozens of apps, websites, and videos to guide you (though an egg-timer and a picture of the exercises works fine); the best I’ve seen (so far) is www.7-min.com. When I started the workout, I was in peak condition, and I found the workout to be almost laughably easy. I actually didn’t break a sweat. But I quickly found ways to dial-up the intensity! I don’t take breaks between the exercise, and I do them for longer (after much tuning, it’s now the 8-minute workout for me). Even just an extra ten seconds for each exercise makes it quite a bit harder (and a few seconds less would be really helpful for someone struggling to get started). The efficiciency is addictive! I still do all kinds of other exercise, but I love knowing that I’m getting as much bang for my buck as possible. It’s been two years now, and I expect to keep doing this workout routinely, indefinitely.